Load Hog® Helper Springs work in conjunction with the existing springs, making them one of the strongest and most effective suspension aids available today. Unlike other products that work independently of the main spring pack, Load Hog® Helper Springs clamp onto the existing springs forming an integral part of those springs. 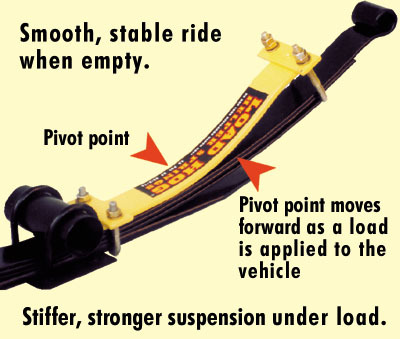 A progressive action is achieved by the unique patented design, which varies the helper springs pivot point depending on the amount of weight on the vehicle. As weight is added to a vehicle or it enters a corner the effective length of the Load Hog® Spring becomes shorter and therefore stiffer providing a ride that is more controllable and more stable when needed. Load Hog Helper Springs are also adjustable, allowing you to set the springs to your exact requirements. To adjust the ride height, a high-tensile steel U-clamp on the end of the Load Hog® can be loosened or tightened with a pair of lock nuts, increasing or decreasing the curvature of the standard spring. the ride height can be adjusted or re-adjusted at any time. Load Hog® Helper springs consist of a quarter-elliptical leaf spring that is shackled via,U-bolts and cross plates to the top of the rear half of the existing leaf springs, the inner end of the helper spring is rigidly shackled to "dead" area of the spring near the differential. The outer end is shackled near the existing spring shackle forming an adjustable link that can be set for any application.